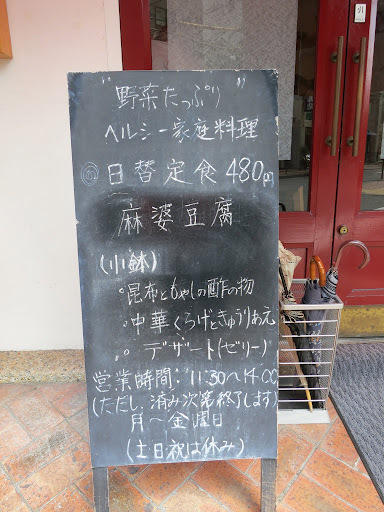 Let’s start with the spoiler: I ate complete meal in the center of Okayama City for only 480 yen! I found Mitsuoka by spotting a line up in front of it and it piqued my curiosity. Mitsuoka is located between the station and the shopping arcade on a small side street and it is so small and unassuming, that you can easily walk right by it and never notice it. The shop is tiny and has only 9 seats, a counter with 7 seats and a small nook with 2 seats. Behind the counter, two ladies are working in an open kitchen not much bigger than the one I have at home. I soon figured out that this tiny restaurant offers only one daily menu which is written on a chalk board right outside the door. Service is quick and I was handed a tray over the counter. 2 salads, miso soup, rice, mabo tofu, a small dessert and a cup of tea. The meal is most definitely homey and simple. If you want to have the feeling of eating in a Japanese house, Mitsuoka is worth a try. The whole tray of food was delicious and fresh. The home made miso soup had some really crunchy daikon in it. The mabo tofu was not spicy( at least compared to my homemade version) , a perfect classic Japanese version of this famous Chinese dish. I’ve only been to Mitsuoka once but I already know that I will be back to try something new. Well, you already know the spoiler, this meal was only 480 yen which beats pretty much all the cheap lunch options out there. If you go, you will probably understand why people are lining up in front of this tiny restaurant.